At least once a fortnight, either I or one of the team are asked if we sell the Pedigree Dentastix range. It’s not surprising really. They are the biggest selling ‘dental chew’ product on the market. With a patented design and marketing and branding that screams “your dog’s teeth won’t be healthy without me”, you’ll find them in 99% of supermarkets and pet stores. 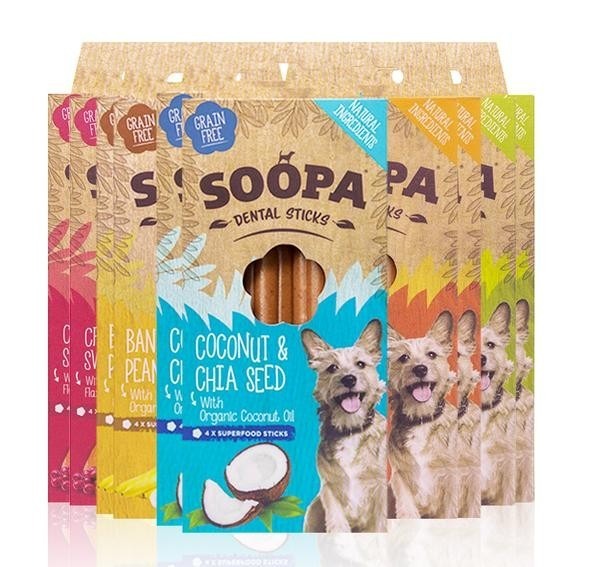 While there seems to be a ‘myth’ that businesses will sell anything that makes money, particularly given the current high street challenges, we consciously made a decision not to stock the Dentastix range (along with a few other products/brands). However, the great news is that while we don’t stock, there are several healthy dog treat alternatives to Pedigree’s Dentastix range. 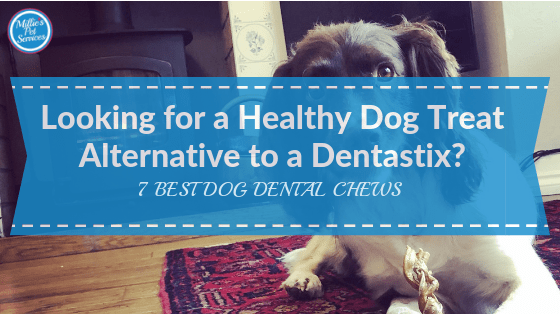 We’re sharing our best 7 dog dental chews in this blog below. When it comes to dog food and treats, I’m more than a little picky. We care about the ingredients that we feed to our own dogs and I know that you do too. Why Won’t My Dog Eat Their Food? So when it came a decision whether or not to stock the Dentastix range, before I even started to compare our ability to compete on price, they were firmly in the ‘no’ category due to the quality of their ingredients. In particular the high levels of cereals and vegetable derivatives and meat and animal derivatives that they contain. It would be hypocritical for me to sell these products when I wouldn’t choose to feed them to our own dogs. Particularly when there are lots of great healthy alternatives. Now don’t get me wrong, as a human, we all love a treat now and again and eat things that aren’t good for us. And you might be wondering, why we can’t apply the same rule to our dogs? Well, at a very basic level, I’d agree that a dogs diet should be balanced, just like our own. The issue for me is around the quality and composition of Dentastix rather than the fact it’s similar to us having a McDonalds instead of a salad for the odd lunch. In 2017, Pooch and Mutt published an article and infographic that highlighted some of their concerns about the ingredients that are used in Dentastix. 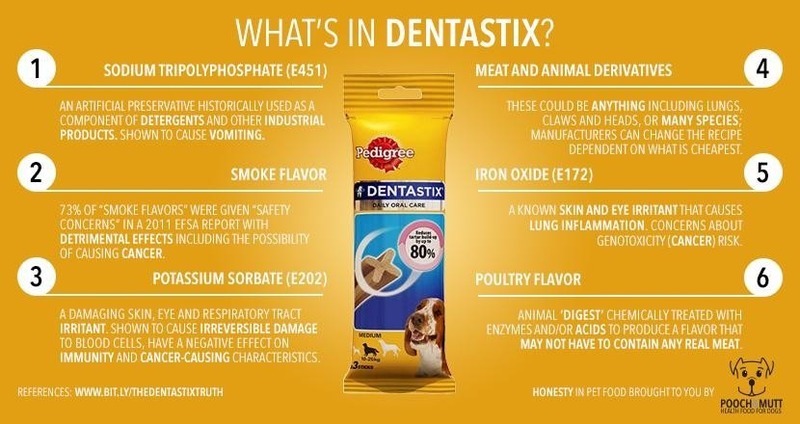 While the way this is written could come across as biased and perhaps a little one-sided, it does help provoke some questions about what Dentastix contain. All of the Soopa Dental Stick Range are hypoallergenic and grain free. They are also 100% made from natural human grade ingredients too! Each stick averages around 70-80 calories with a pack (£3.99) containing 4 ‘superfood’ sticks. Buy Online via our shop HERE or visit us in store. A new addition to the dog treats market in 2018, which were launched alongside their grain free, gluten free, sustainably sourced dog food. We love these sticks due to their spiral shape and the fact they have no artificial colours, flavours or added ingredients! 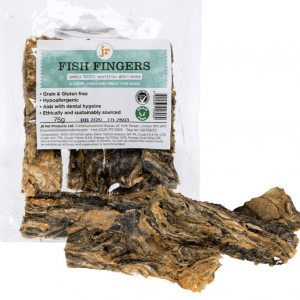 Due to their texture, which could aid with dislodging tartar build up, these fish finger treats from JR Pet Products are also fab for aiding dental hygiene. Perfect for dogs who need a low-fat option, they are grain free and gluten free, made from 100% whitefish jerky skins. 100% pure tripe pressed into the shape of a bone and available in small to large sizes. Great for maintaining a healthy gut, they can also aid help care for teeth and gums. And as with all of the JR Pet Product range, they are ethically and sustainably sourced. 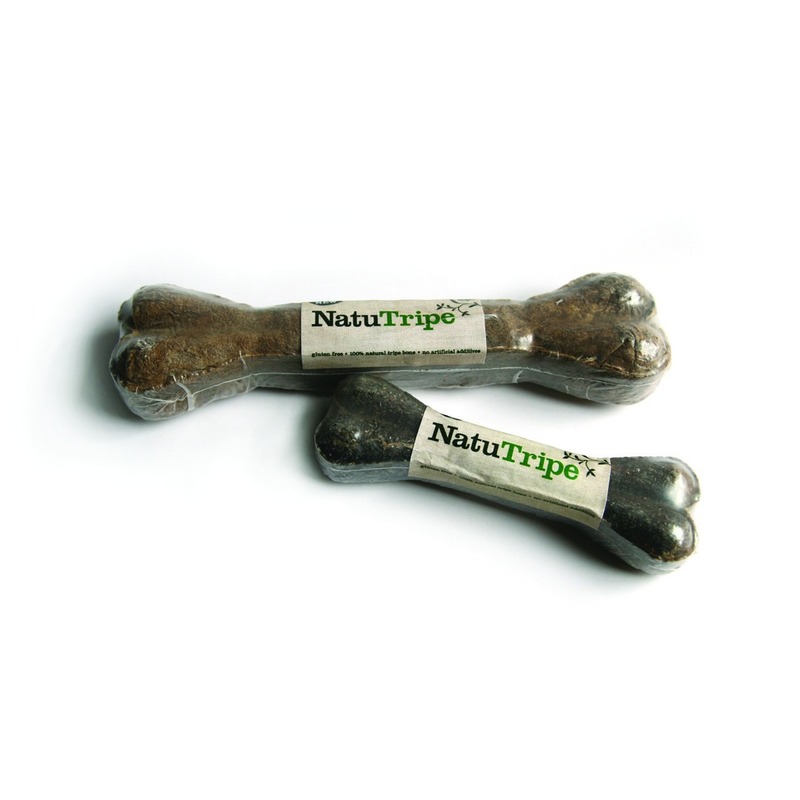 Priced between £2.50 (pack of 2 small bones) to £3.99 (large). Yakers find their origin in the hills of the Himalayas and are made from a mix of skimmed Yak and Cow milk. A very small amount of lime juice and salt is added to coagulate (harden) the milk, which is then compressed into blocks and smoke dried for 28 days to give the chews their unique flavour. 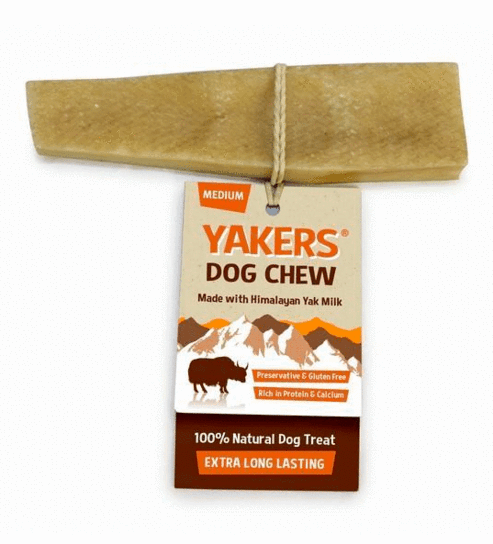 Depending on the size of the dog and how aggressively they chew, Yakers can be an extremely long-lasting treat. If you can get the small end piece off your dog before they finish – you can also put the small end pieces in the microwave for 30 to 60 seconds until they puff up. Allow to cool and then give back to your dog to finish the treat. Priced from £2.99 (small) upwards. 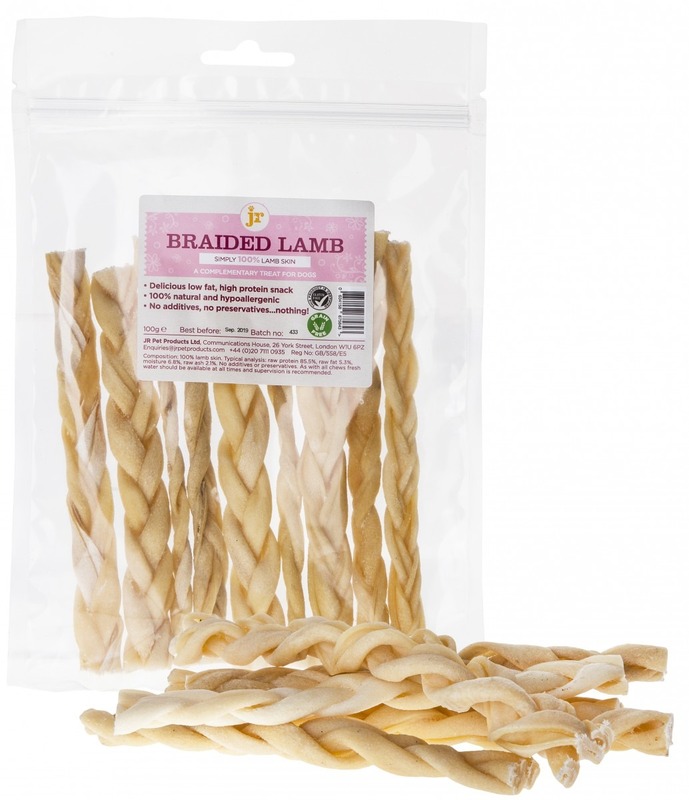 With no added preservatives or other ingredients, these lamb braids are a great option for dogs who may be allergic to beef and pork and are low in fat. A 100g bag typically contains around 7 sticks and priced at £4.99. Low odour (yippee!!! ), these are a fantastic treat for dogs sensitive digestion and allergies. We have several customers who can’t use other treats, even our 100% protein range but Rabbit Ears cause no issues (whoop!). Available without fur or with fur (can aid with worming) and of course – 100% rabbit so grain and gluten-free! 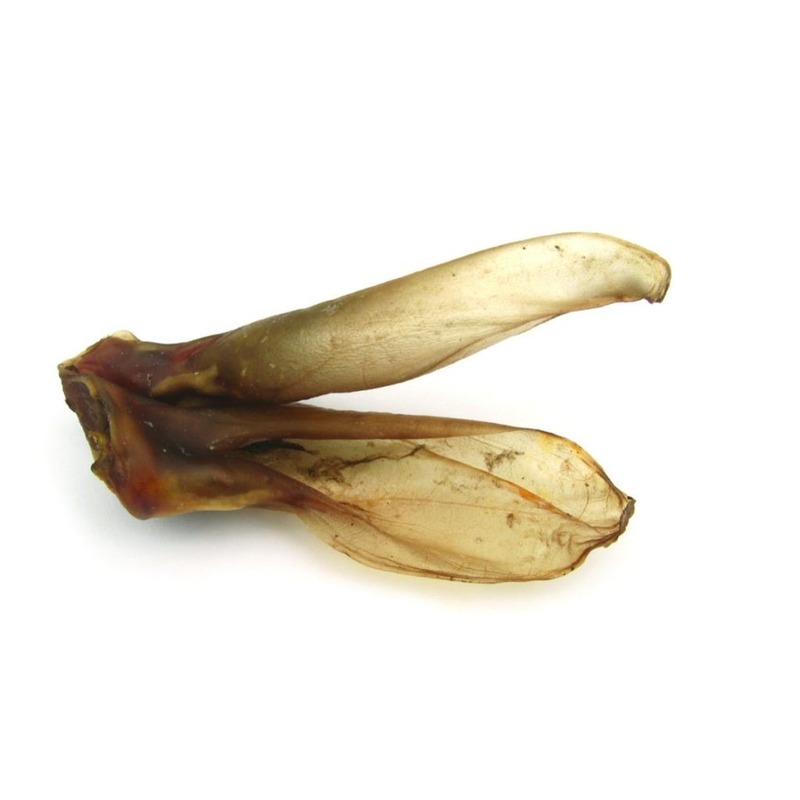 A 100g bag typically contains around 6 rabbit ears and priced at £4.99. As with all dog treats, we always recommend turning the packet over and reading the back to check for ingredients. 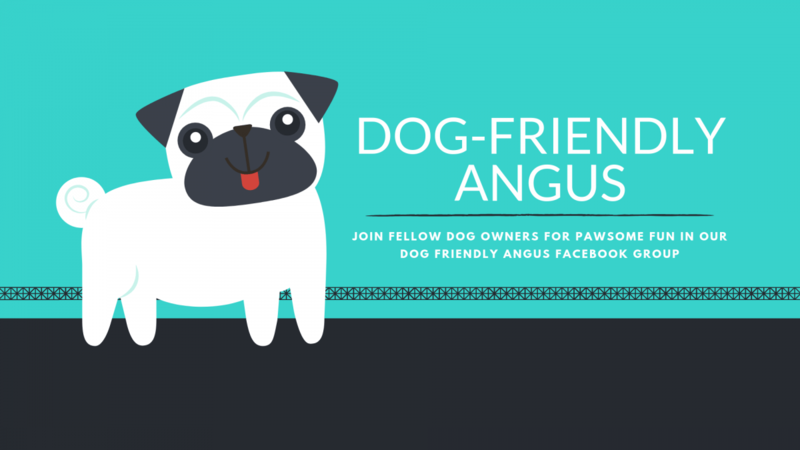 This is particularly important if you have a dog with allergies or sensitivities. Choose the right size of chew for the size of your dog. I know with my own spaniels, they can be tempted to gulp them down, so make sure they won’t be a choking hazard. Remember to check the calories and deduct these from your dog’s daily feeding allowance. Another reason to make sure the quality of the dog chew is equivalent to the food you use (or better!). Do check that the dog dental chew is suitable for the age of your dog. Particularly if feeding to young puppies. Does My Dog Need Dental Chews? When it comes to dogs teeth, if not regularly cleaned, the plaque will build up and turn into tartar. This will look like a brown, gritty surface on our dog’s teeth and could lead to painful, inflamed gums and even gum disease. Something we want to avoid! But do they need dental chews to combat the build-up of tartar? The frank answer is no. They don’t NEED dental chews as there really is no better way to keep your dog’s dental hygiene tip-top than by brushing their teeth regularly. So when it comes to dental chews, while they are not ‘needed’ if you follow a brushing routine, they can aid with preventing tartar build-up and thus many owners choose to use these to help with prevention. Dogs also have a natural urge to chew, so this can help satisfy that urge. And well, we all know we love to give them the odd treat or two! And our 7 recommendations are definitely YUMMY! Does your dog love a dental chew? 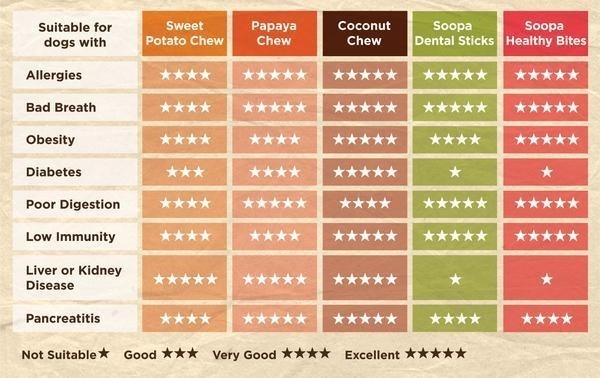 Did their favourite make our ‘best dog dental chew’ list? We’d love to hear how you get on with our faves! Just jump into the comments below! Big fan of the JR tripe bones! Don’t really use them for teeth they are more a hiking snack for my lot but they do love them. Will have to pop down to stock up on some more!